SAVE with our Travel Ready Combos! 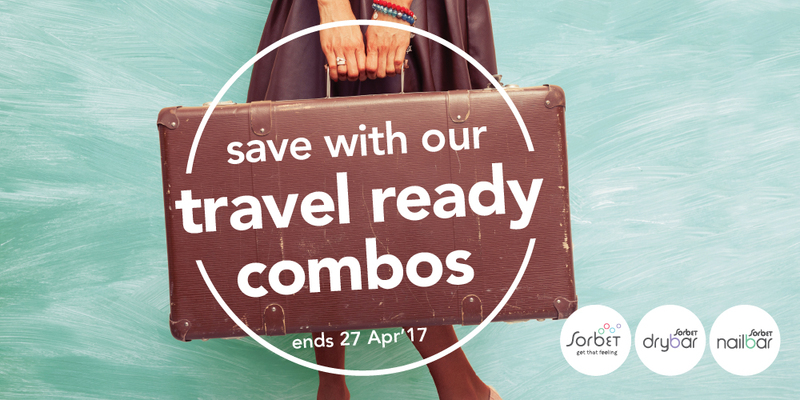 Whether April says HOLIDAY or HOME we have a selection of fab travel ready combos with a bonus save for each! Stop by your nearest, Sorbet Salon, Sorbet Drybar, or Sorbet Nail Bar to take your pick of these Travel Ready treatments! We look forward to smooth sailing with you this April! Scratch cards do not expire. They can be redeemed at at ALL Sorbet stores nationwide. It may not be exchanged for cash and no cash back will be given as change. It is non-refundable and cannot be replaced if lost and stolen. Photocopies of this voucher will not be accepted. This voucher may not be used in conjunction with any other promotion or voucher. Only one voucher may be used for a single purchase.